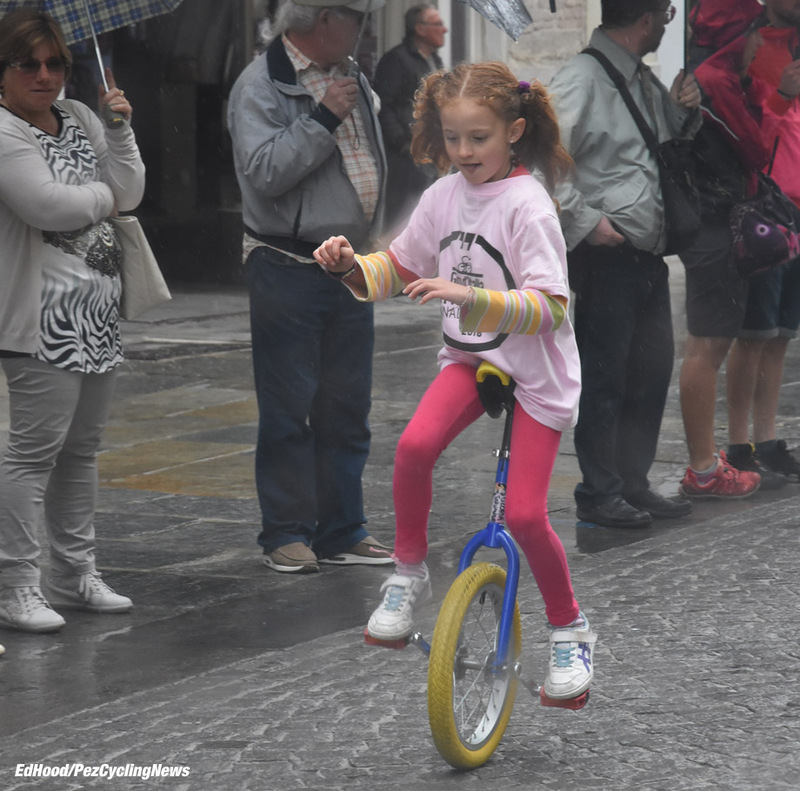 PezCycling News - What's Cool In Road Cycling : GIRO’16 Roadside: Turmoil In Turin! 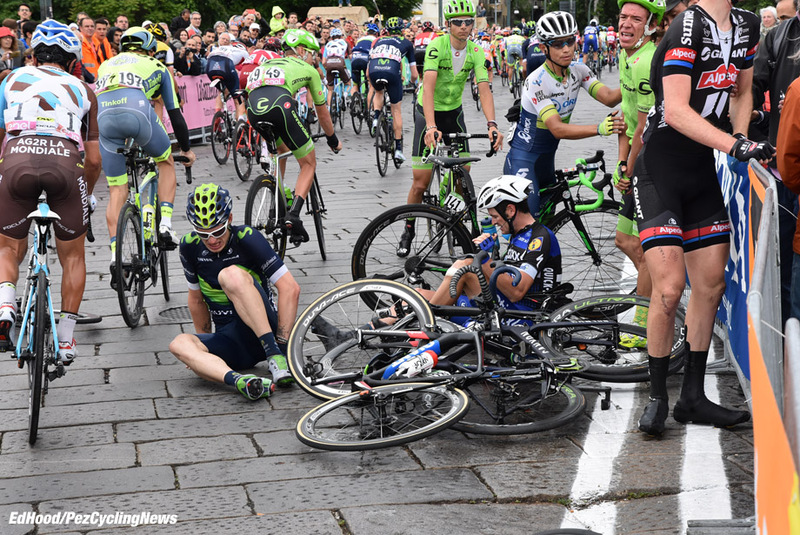 GIRO’16 Roadside: Turmoil In Turin! 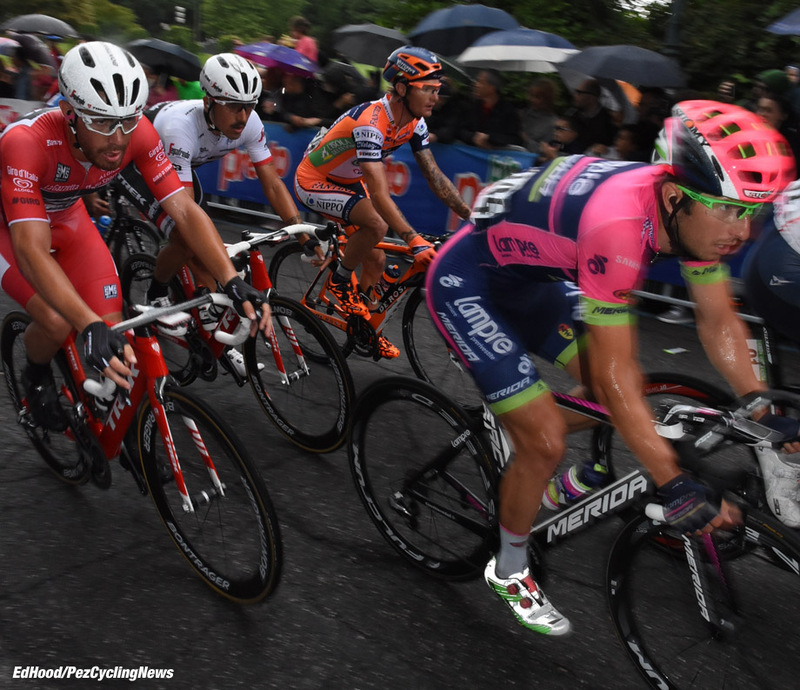 The last stage of a Grand Tour can be a tad 'flat' - not this one; huge crowds, the stage winner disqualified and two of the top ten on the deck, including Esteban Chaves - right at PEZ's feet. But 'The Shark' wins the GC from Chaves and Valverde and Arndt gets the stage win to top and tail the race for Giant after Dumoulin's win in Stage One. We'll tell you all about it right now . . . The guy whose nice country B&B we were supposed to be staying at has messed up the booking - so he guides us to the Hotel Excalibur in Revello. The room is clean, the wi-fi average and there's some sort of festival going down in town. The whole town is madness and noise but we're so tired we sleep through it. 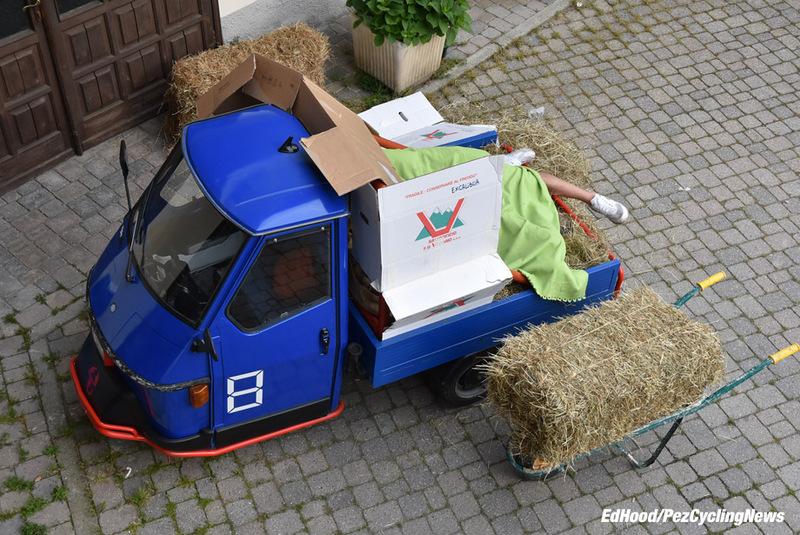 In the morning, Dave looks over the balcony, a couple of dudes are crashed out on straw bales and cardboard in the back of a tiny Piaggio three wheel pick up. Oh to be young in La Bella Italia. Soon after the dudes stirred and drove home there was a huge electrical storm - we drove to the start in Torino on wet roads through rain showers. Tears of joy from the Heavens for Vincenzo or tears of sadness for Steven? 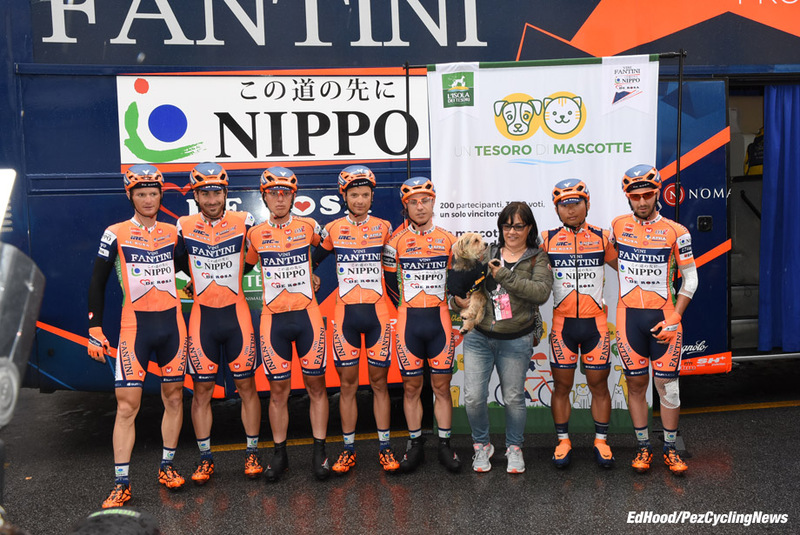 Damiano Cunego puts a brave face on for the official Nippo team photo despite Spanish brigand Nieve pillaging his lovely blue montagna jersey, yesterday. The dog? He's the team mascot, personally I'd have gone for something bigger - a Caucasian Mountain Dog perhaps? The last time we took pictures at the Jumbo Lotto bus it was all pink and smiles. Today the rain just adds to the funereal air around the Dutch team's bus - a couple of loyal fans stand and dream of what should have been. 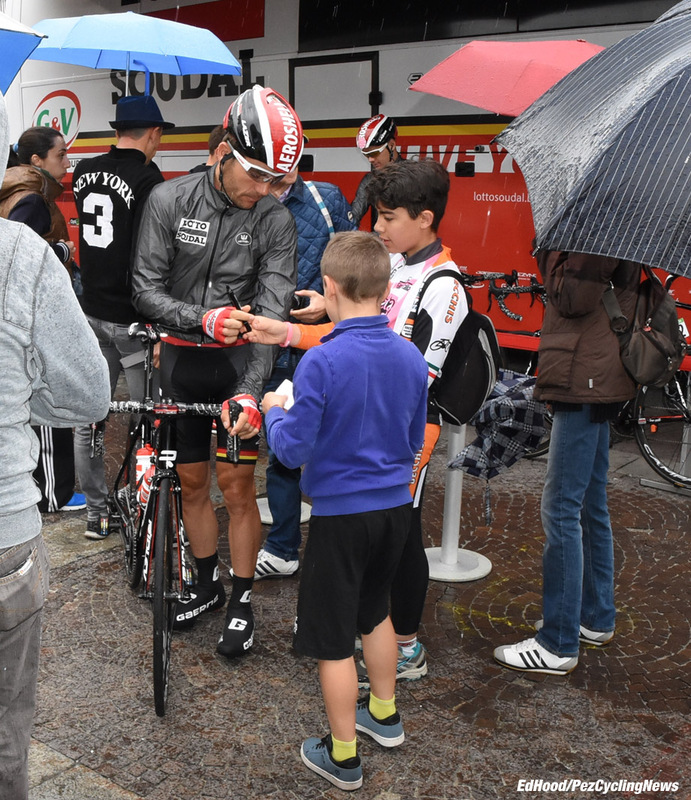 Rain or not if you're a pro, you're a pro - and those autographs have to be scribbled. 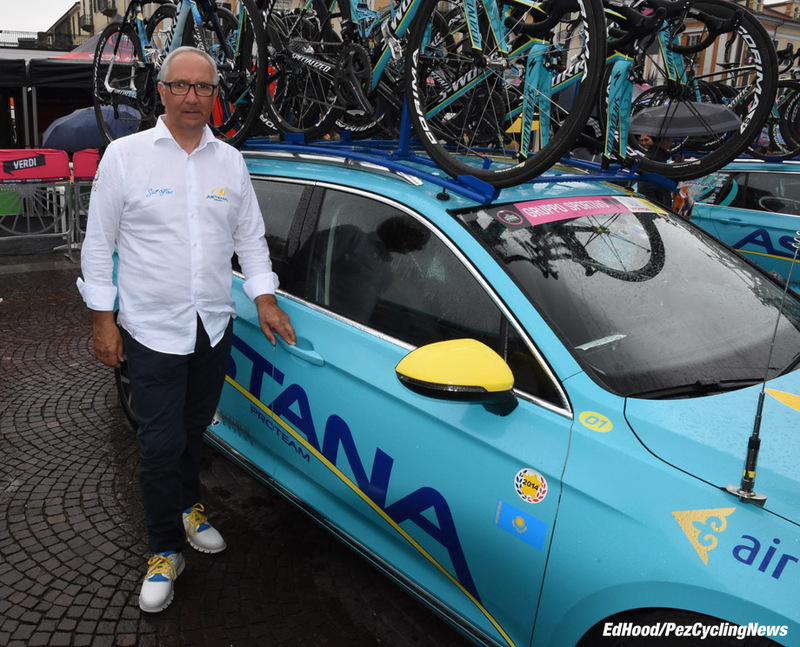 A picture of Vincenzo would be a tall order, this morning, it'll be like the Calgary Stampede around him but manager Martinelli is happy to accept our congratulations and pose in his freshly laundered Astana white shirt and team shoes. We lurk down at the sign-on for a wee while before we have to high tail it to Torino; and there's Ferrari - sun or rain, that dude is cool. And close behind the man he puts it all on the line for - Sasha Modolo. If the script is followed - a rare thing in this Giro - it should be a straight shoot out between Modolo and Trek's red points jerseyed Nizzolo, today. Yesterday's stage winner, Taaramae has reverted back to his stony faced Baltic Hardman visage - a great ride by the multiple Estonian time trial and road race champion to go with his Vuelta stage win. He started out as a stagiare with Cofidis way back in 2007. Time to go - but not before we snap a rider in perfect control of her ultra-short wheelbase machine. 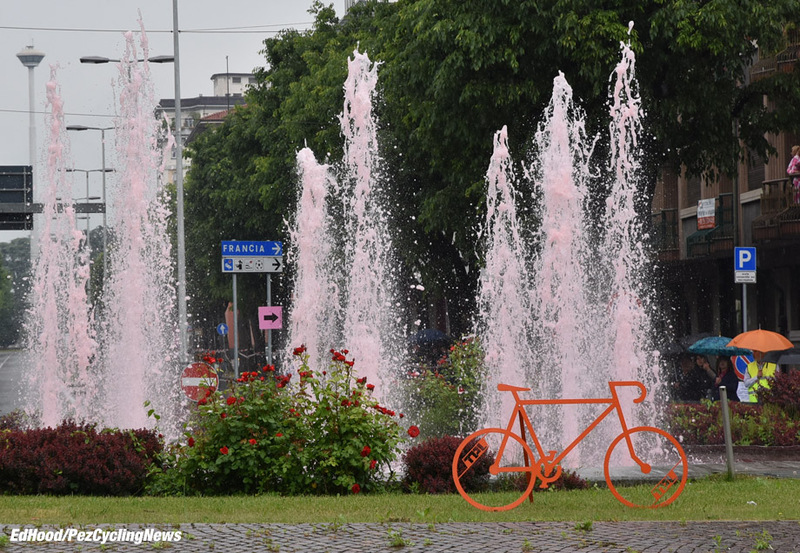 And in Cuneo they've taken the Giro so much to heart that even the water in the fountains is pink. The tappa route between, Cuneo and Torino? 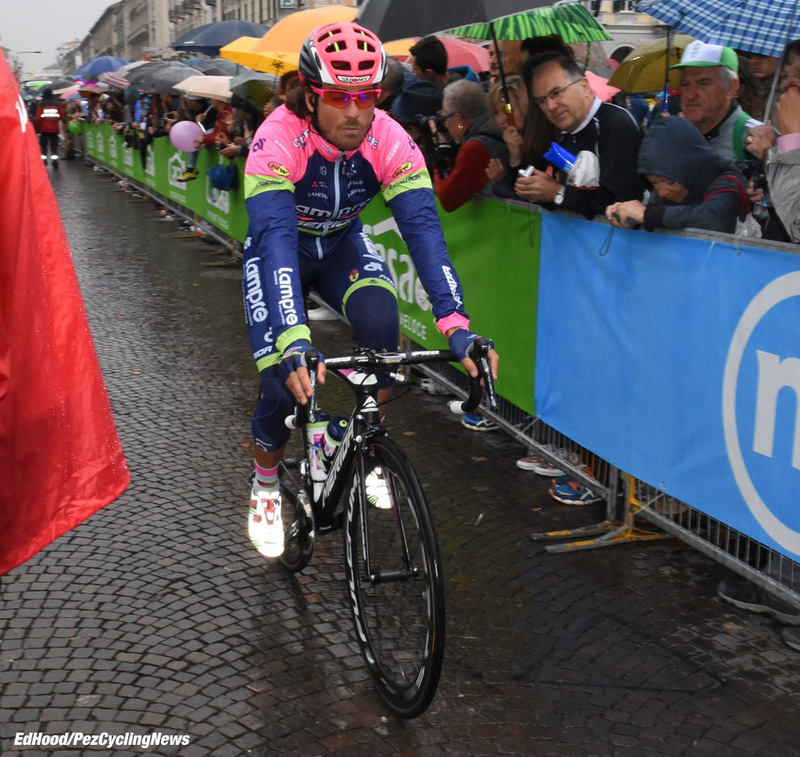 It's well in line for the most uninspired percorso in the history of the Giro but there's a bit of pink on display along the way. 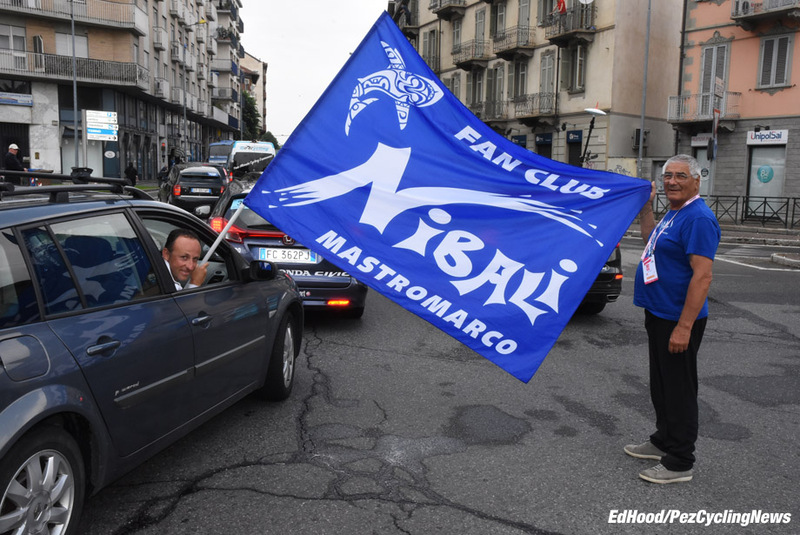 We run into Torino, behind 'The Shark's' supporters club - there'll be a big party this night. 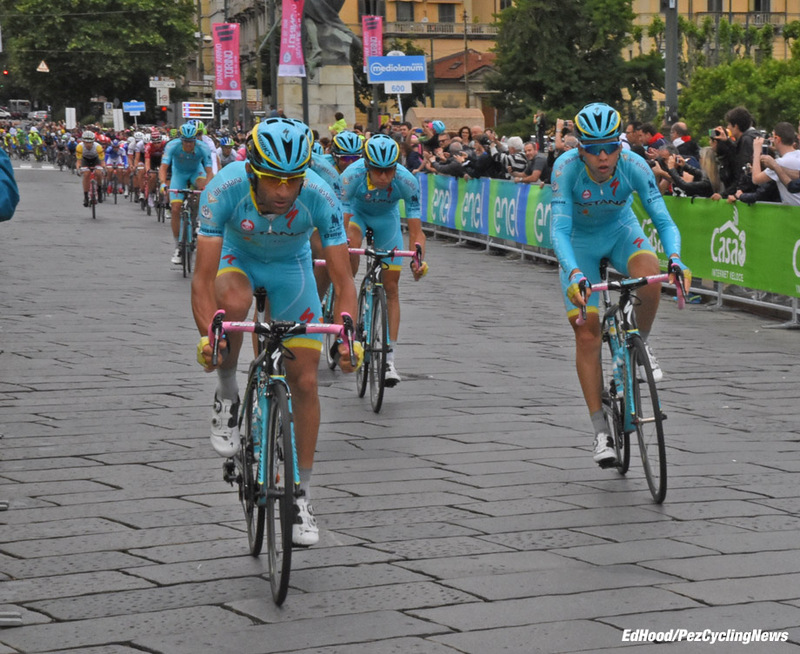 The race soon zooms into Torino right on cue through huge crowds - but NO ceremonial lap of honor for Astana. 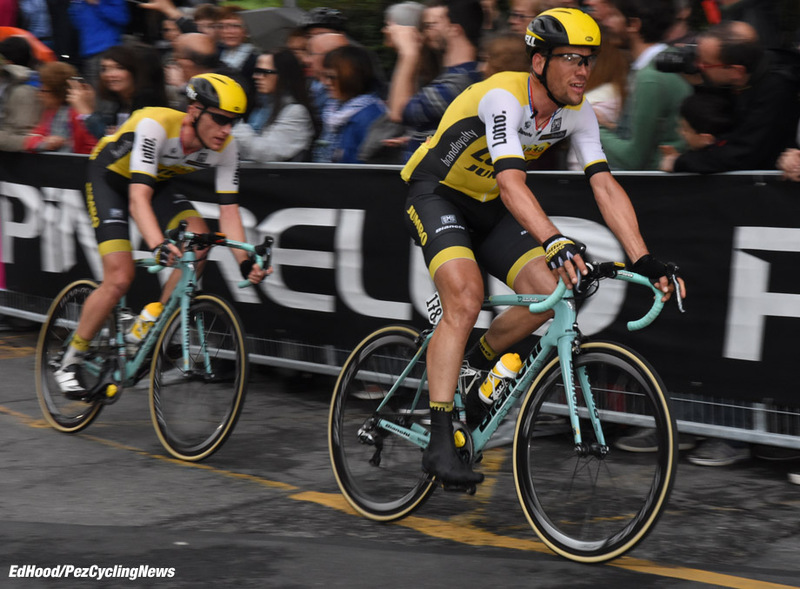 Two Jumbos have jumped clear, Tjallingii and Van Emden. Big strong boys putting on a display to remind us of the fact that this race could have ended very differently . . . 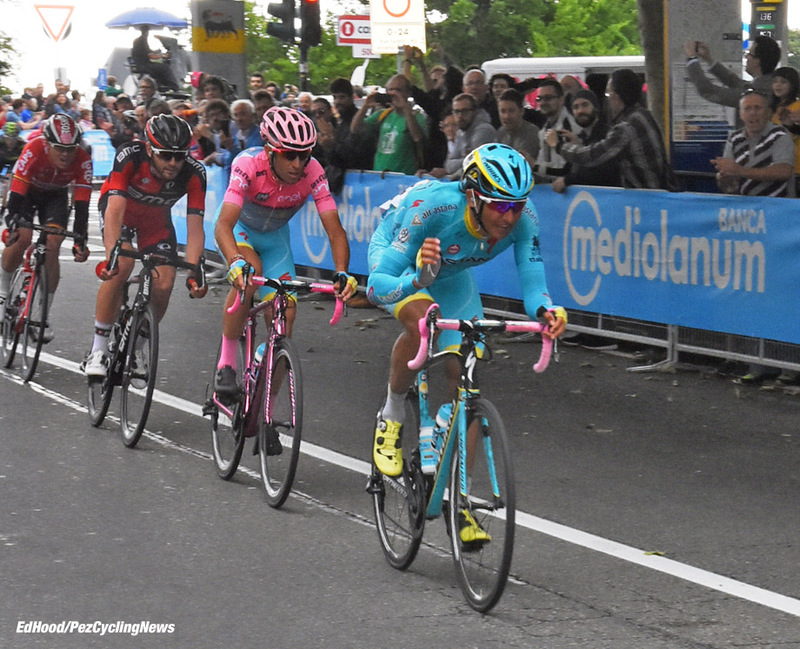 But Astana are on the front of the bunch for the first few laps with Vincenzo safely tucked in. The color scheme of his Specialized? You best decide that for yourselves. The stage should end in a straight shoot out between Nizzolo and Modolo; the big Trek rider is going to win the red points jersey but desperately wants a stage win. He knows Modolo is the biggest threat and is joined at the hip to him, this afternoon. Dave shouts and points - crash! 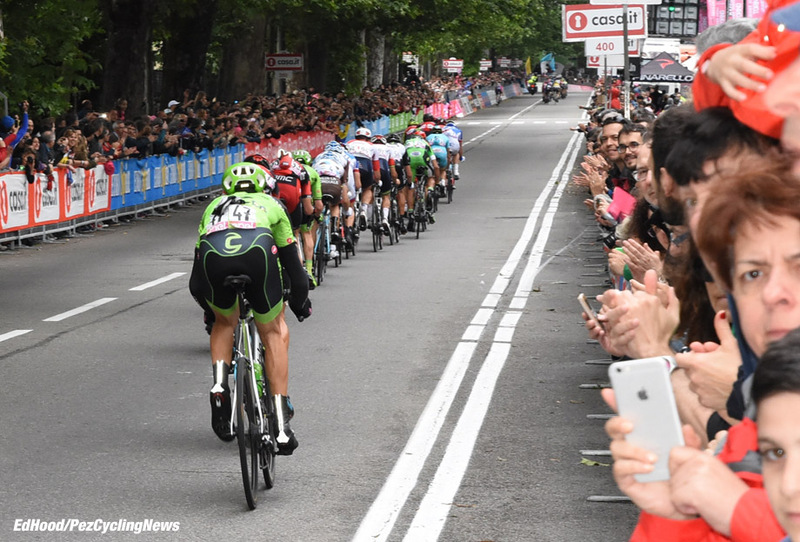 It's a nasty one and both Chaves and Uran are on the deck - it takes an age to unravel, a good job standings are taken on the entrance to the circuit. Both Colombians are way off the back of a bunch which gets faster in pursuit of the two Jumbos every lap. 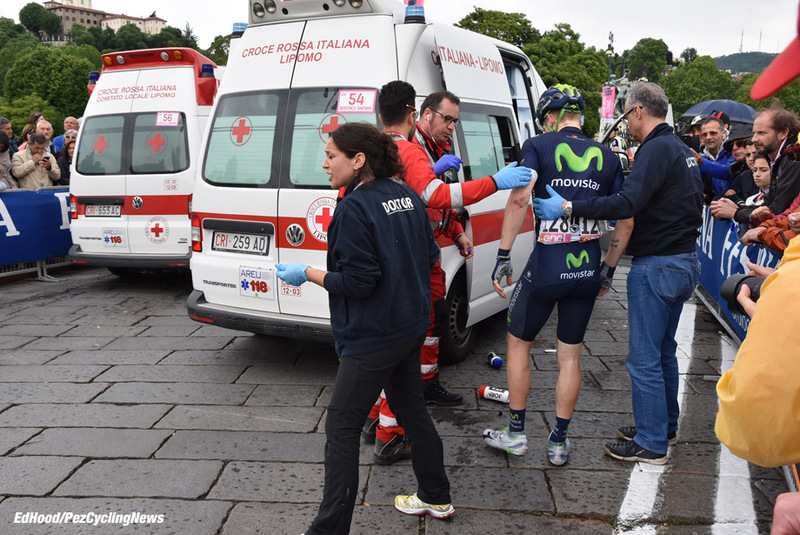 Movistar's Sutterlin has it even worse, well into the 21st stage he has to board the race ambulance. So too did Dimension Data's van Zyl with a broken elbow - very hard on the two young men. 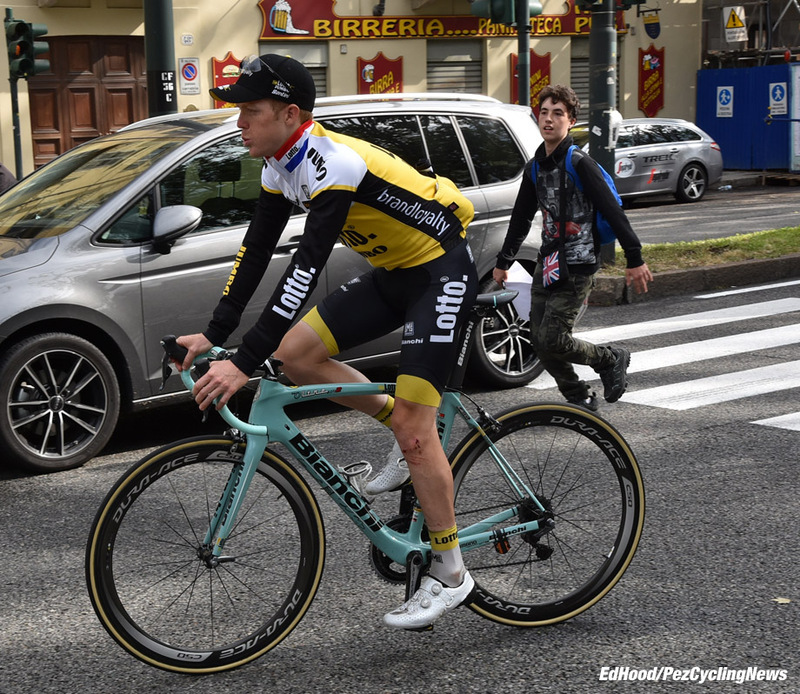 As a result of the crash and warp speed it's hard to keep track of what's happening with a splintered peloton but Vincenzo looks relaxed enough in what is now a very fast criterium with the Jumbo heroes only succumbing late in the day. The bell, the speed is mad when they pass us with 500 to go. Nizzolo! 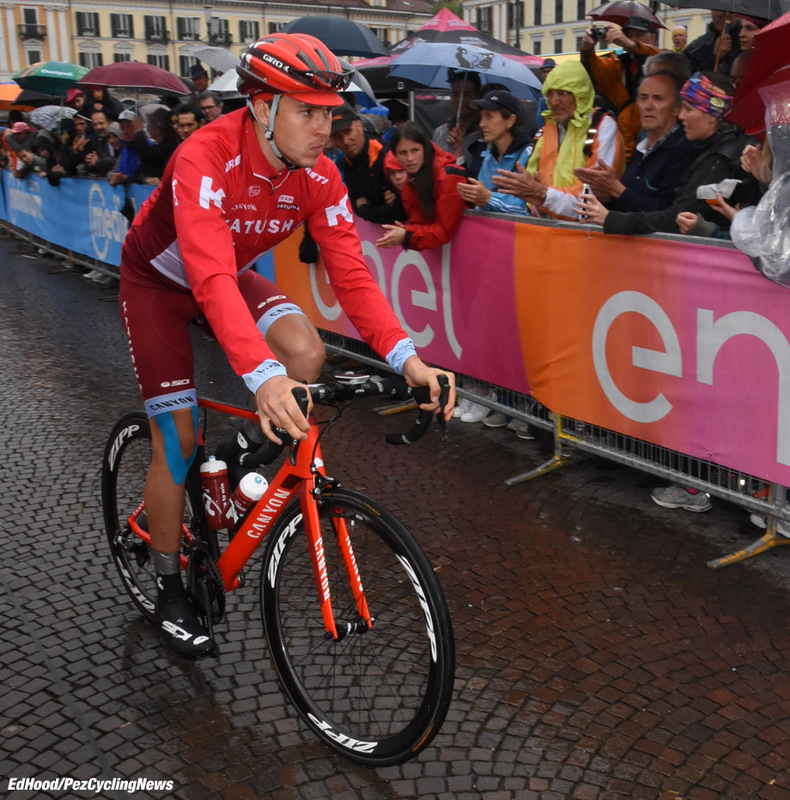 Ends his run of 13 podiums in Giro stages - well, for a little while until the jury pick that 'irregular sprinting' cherry from the tree. To us, there was nothing wrong with Nizzolo's sprint - Modolo should not have tried to come on the fence side. 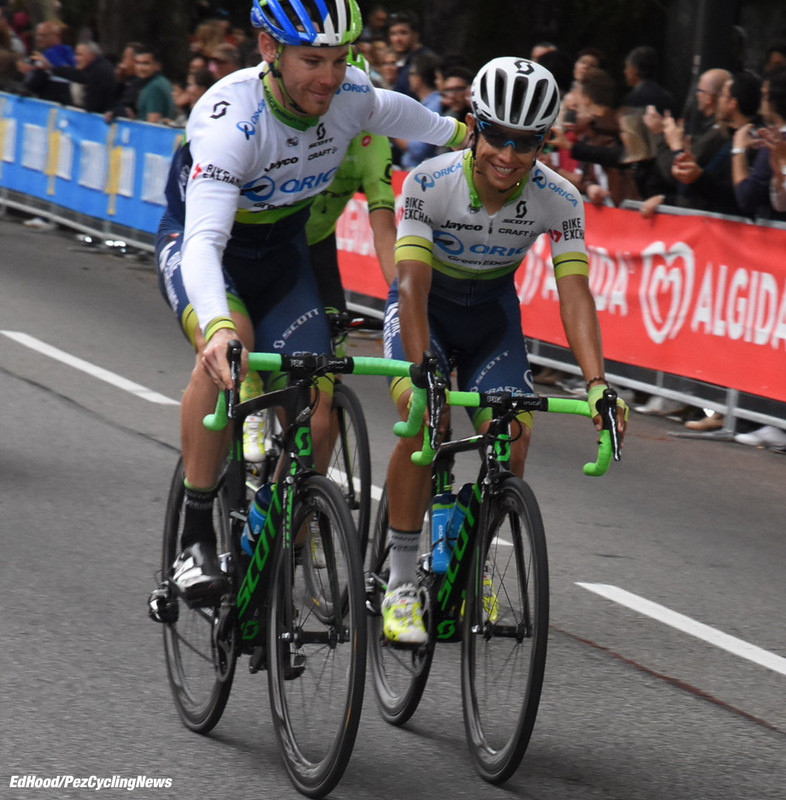 Chaves smiles at last, chaperoned by Hepburn - crashes and crits aren't what Colombians thrive on. 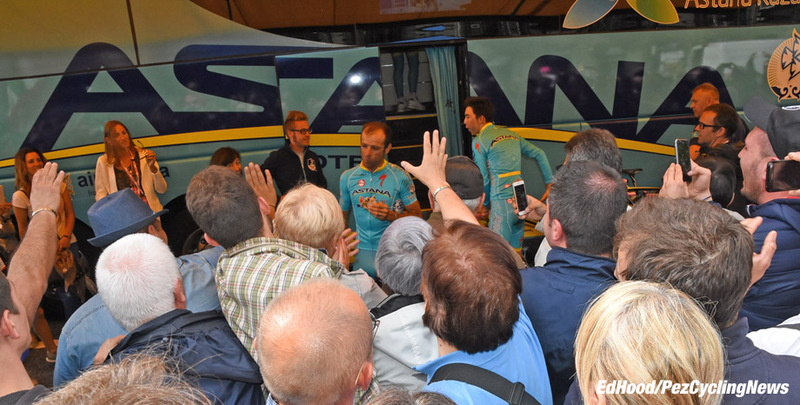 While Nibali takes the plaudits on the podium, Scarponi enjoys pagan idolatry at his team bus - munching some 'real' grub for the first time in a month. 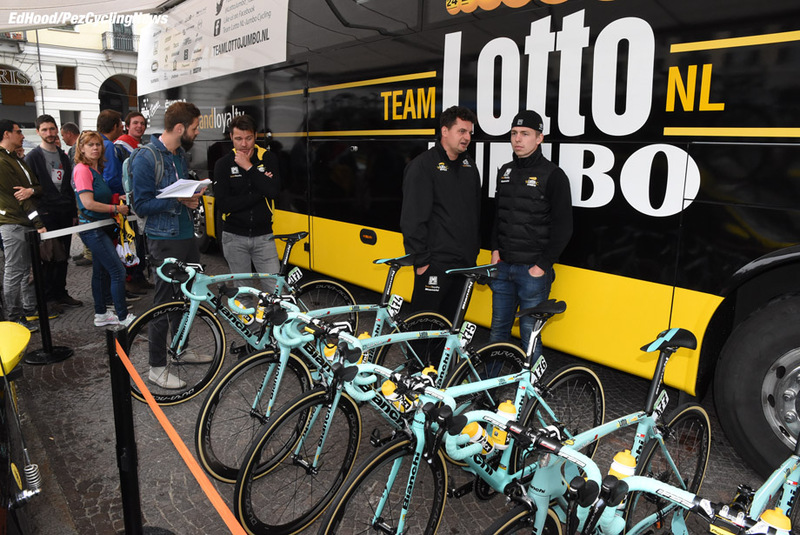 We hover at the Jumbo bus, we think the last picture belongs to Steven Kruijswijk. Just one moment's inattention cost him everything - but the man rode such a great race. 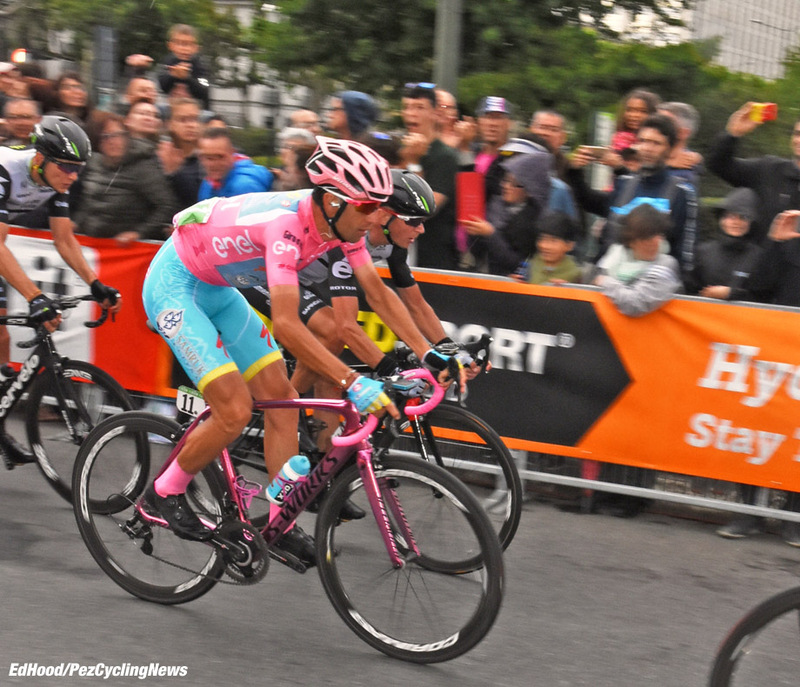 A great Giro, we hope you liked our reports as much as we liked providing them. With thanks to Dave for the driving and computer stuff, Al Hamilton our editor for putting it all together and to Mr. Pestes for my 10th Giro.